A number of large-scale transformations have shaped the economy, polity and society of India over the past quarter century. This book provides a detailed account of three that are of particular importance: the advent of liberal economic reform, the ascendance of Hindu cultural nationalism, and the empowerment of historically subordinate classes through popular democratic mobilizations. By seeking to explain the causal relationships between these central transformations through a coordinated conversation across different disciplines, the dynamics of India’s new political economy are captured. Chapters focus on the political, economic and social aspects of India in their current and historical context. The contributors use new empirical research to discuss how India’s multidimensional story of economic growth, social welfare and democratic deepening is likely to develop. This is an essential text for students and researchers of India's political economy and the growth economies of Asia. 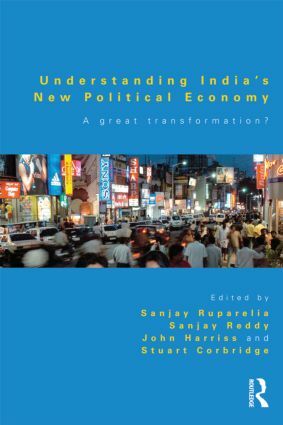 "A rich selection of essays that will prove to be an important resource for understanding the rapidly changing political economy of contemporary India." - Jeffrey Witsoe, Union College; Pacific Affairs 2013. Sanjay Ruparelia is an Assistant Professor of Politics at the New School for Social Research in the US. His current research examines the politics of the broader Indian left in contemporary Indian democracy in the wake of economic liberalization and Hindu nationalism. Sanjay Reddy is an Associate Professor of Economics at the New School for Social Research in the US. His areas of work include development economics, international economics and economics and philosophy. John Harriss is Professor of International Studies at Simon Fraser University, Canada. His current research concerns India's social policy in the context of liberalization. Stuart Corbridge is Professor of Development Studies at the London School of Economics and Political Science, UK. His previous publications include Reinventing India: Liberalization, Hindu Nationalism and Popular Democracy (2000, with John Harriss).